Prom, Wedding, Bridesmaid & more. We will not be publishing the Crochet N More Newsletter on June 15th. the next issue will be published on June 30th. 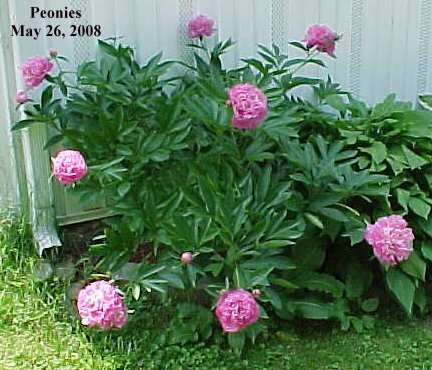 I took this photo of my peonies on Memorial Day. with info on purchasing the calendar. reflect the kind of care they get." Let not your heart be troubled; believe in God, believe also in Me. In My Father's house are many dwelling places; if it were not so, I would have told you, for I go to prepare a place for you. And if I go and prepare a place for you, I will come again, and receive you to Myself; that where I am, there you may be also. And you know the way where I am going. You have heard that it was said, "YOU SHALL LOVE YOUR NEIGHBOR, and hate your enemy." But I say to you, love your enemies, and pray for those who persecute you in order that you may be sons of your Father who is in heaven; for He causes His sun to rise on the evil and the good, and sends rain on the righteous and the unrighteous. And He said to them, "Go into all the world and preach the gospel to all creation. He who has believed and has been baptized shall be saved; but he who has disbelieved shall be condemned. WILL BE RIGHT AT HOME IN HEAVEN." This quote is from Our Daily Bread - May, 2008 Issue. Blessed are the poor in spirit, for theirs is the _____ of ________. Asterisks, daggers and other symbols are used in patterns to keep the language to a minimum. When you see any of these symbols you should be asked to repeat instructions from one symbol or between two symbols later on in your pattern. I want to make a baby afghan, but I am stuck on the dagger and * signs. then rep from dagger to dagger once;ch 1 turn. What does that mean? Any help you can give me thank you! The daggers are like asterisks. The are only used as a reference in a pattern. In your case you repeat the instructions between the daggers. Row 1. Sc in the second chain from the hook. Sc in each of the next six chains. single crochet in the next chain. Sc in each of the next seven chains. skip the next two chians single crochet in each of the next seven chains. Now repeat all instructions from the asterisk 8 more times. Then repeat the instructions between the daggers once. Sometimes traditional stitch markers are too big. When crocheting with bedspread weight cotton thread use regular sewing thread in a contrasting color to mark your stitches. It marks the stitches nicely and pulls out easily when you finish. do you have number 48? Hi!! No problems with this pattern - in fact just the opposite - i have made a ton of these for my DD's dollies and now for a soon to be born niece. My lastest accomplishment was a beautiful teal/white skirt for my 4 yr old daughter for her last day of school - it was a BIG hit and everyone loved it. she wants more in different lengths and colors!! I just LOVE this pattern and cant wait to make more. Just wanted you to know that it is a WONDERFUL pattern and I thank you from the bottom of my heart - and so does my daughter!! Thank you so much for the plain english explanation Lisa. I understand what you're saying much better and can't wait until the weekend when I can work on my project. I truly appreciate your help. And also, thank you for your site, it is wonderful. I absolutely love your website. I look forward to getting the newsletters. Keep up the wonderful work. God Bless. 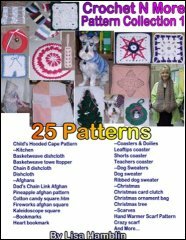 I am looking for a very simple afghan pattern. My Daughter wants one that doesn't have to many hole. Found one I can use I think on here. This kind of site makes me appreciate the thought that God has provided once again. May He Bless You. I want you to know I love your website I'm just learning how to crochet and your website seems to have all I need to follow the directions for the patterns you have on here. Thank You so much for your time building this website I know it takes alot of time so God Bless You! Enjoyed your site. 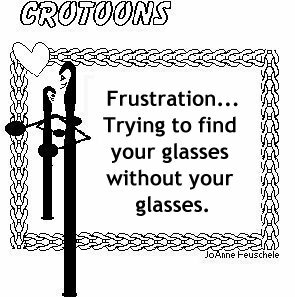 I just lost my crochet site. Will be back to visit. 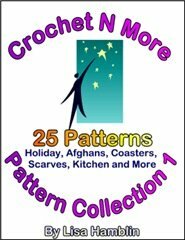 I have been crocheting for 55 years. Great site. Came looking for a beanie pattern for toddlers. Didn't find one, but enjoyed the site very much. So good to find a site that is not afraid to proclaim the need for us to know Jesus as our personal Saviour. The world says we must be PC, but I don't think Jesus was. He spoke straight to the need of men. So keep up the good work, be not afraid for the Lord will surely add His Blessing to your site. "Here, maybe you'd like a nip to calm your nerves." "Well, I'd rather not," said the first. "At least not until after the police have been here." Passengers aboard a luxurious cruise ship were having a great time when a beautiful young woman fell overboard. Immediately there was an 80-year-old man in the water who rescued her. The crew pulled them both out of the treacherous waters. The captain was grateful as well as astonished that the white-haired old man performed such an act of bravery. That night a banquet was given in honor of the ship's elderly hero. He was called forward to receive an award and was asked to say a few words. He said, "First of all, I'd like to know who pushed me." When the power failed at the elementary school, the cook couldn't serve a hot meal in the cafeteria, so at the last minute she whipped up great stacks of peanut-butter-and-jelly sandwiches. As one little boy filled his plate, he said, "It's about time. At last -- a home-cooked meal!" Our pastor, an avid golfer, was once taking part in a local tournament. As he was preparing to tee off, the organizer of the tournament approached him and pointed to the dark, threatening storm clouds which were gathering. "I trust you'll see to it that the weather won't turn bad on us." Our pastor shook his head. "Sorry," he replied. "I'm sales, not management! "Why is the bride dressed in white?" A mother looked out a window and saw Johnny playing church with their three kittens. He had them lined up and was preaching to them. The mother turned around to do some work. A while later she heard meowing and scratching on the door. She went to the window and saw Johnny baptizing the kittens. "Johnny, stop that! You'll drown those kittens." "They should had thought of that before they joined my church." Hailey, 4, heard a thunderstorm rumbling overhead and asked her parents and grandparents to listen to it. After the thunder stopped, Hailey told everyone to be quiet for a minute and she began to pray and asked God to stop the thunder and lightning. Immediately after she said "Amen," another clap of thunder was heard. Hailey looked up towards heaven and said, "You're not listening!" BIT: A word used to describe computers, as in "Our son's computer cost quite a bit." CHIPS: The fattening, non-nutritional food computer users eat to avoid having to leave their keyboards for meals. COPY: What you have to do during school tests because you spend too much time at the computer and not enough time studying. CURSOR: What you turn into when you can't get your computer to perform, as in "You $#% computer!" DISK: What goes out in your back after bending over a computer keyboard for seventeen hours at a clip. DUMP: The place all your former hobbies wind up soon after you install your computer. ERROR: What you made the first time you walked into a computer showroom to "just look." EXPANSION UNIT: The new room you have to build on to your home to house your computer and all its peripherals. One October, my wife and I spent a vacation on Washington's Olympic Peninsula. We were eager to visit the rain forests near the coast, but we heard that snow slides had made some of the roads impassable. Although apprehensive about the conditions we might run into, we drove on. Sure enough, we had only gone a short way up the High Rain Forest road when we saw a sign that read, "Ice: 10 Miles." Five miles farther on, there was another sign that said, "Ice: 5 Miles." The next one read, "Ice: 1/2 Mile." We practically crept that half-mile. We finally came to the last sign. It was outside a small grocery store and it said, "Ice: 75 Cents." In January 1991, I was being deployed to Operation Desert Storm. Before boarding the C-141 transport at Shaw Air Force Base in South Carolina, I had to go through tight security. After a meticulous X-ray examination of my carry-on bag, I removed all metal objects from my uniform and was finally able to pass through the detector without setting off the alarm. "Just out of curiosity," I asked the airman operating the checkpoint, "why did you make me go through all that?" "We want to be sure you aren't carrying any weapons on board," he said, handing me back my M-16 rifle. A Sunday-school teacher returning from work one day heard his little boy and girl quarreling with each other. It looked as if they might come to blows. "Children, why are you fighting so?" "Why, teacher, we aren't quarreling really; we're just playing mother and father." 5. The shirt your child must wear today will be the only one that needs to be washed or mended.